What does it take to survive a night among the living dead? Anyone familiar with George A. Romero’s classic 1968 film Night of the Living Dead knows your chances really aren't that good. 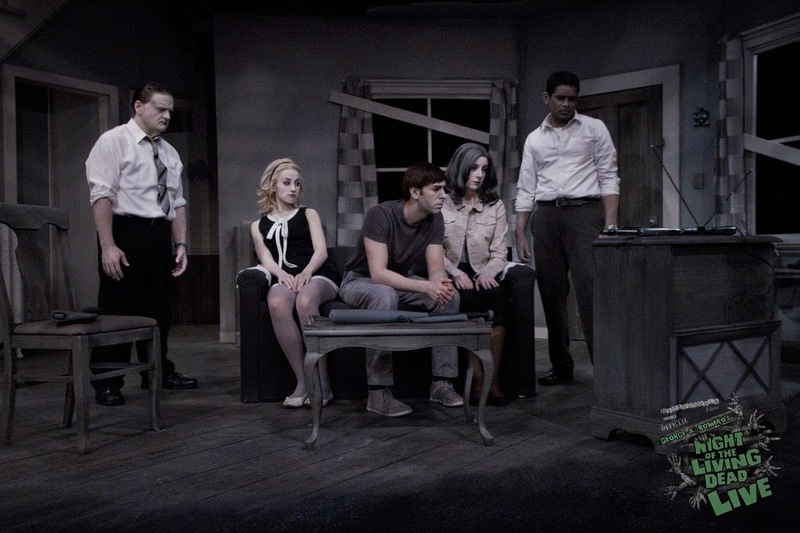 Until October 27, Nictophobia Films is bringing the genre changing horror film to the stage with Night of the Living Dead Live! 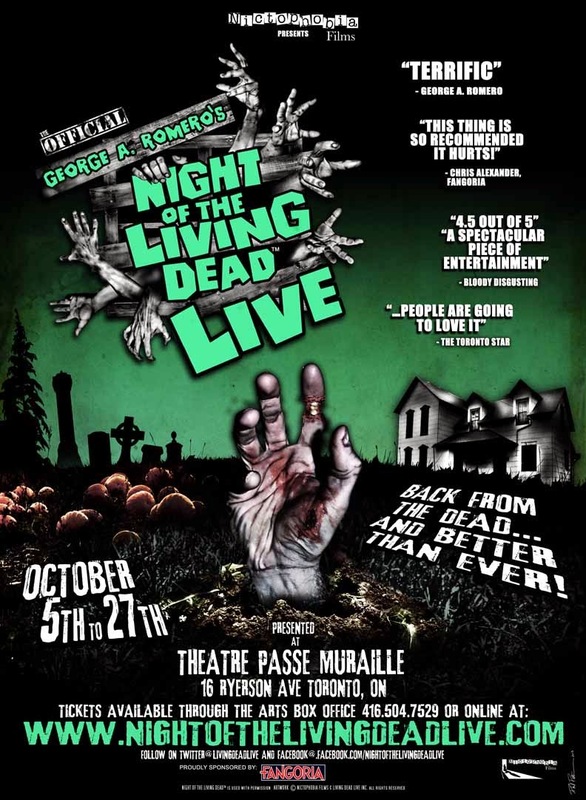 at the Theatre Passe Muraille to celebrate the iconic film and explore the chances of surviving a night among the undead. 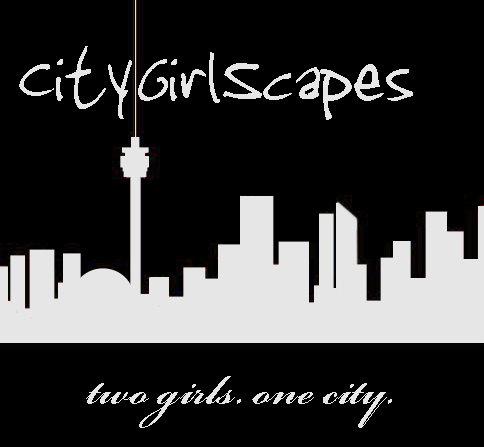 Let us set the scene. Theatre Passe Muraille is situated down a quiet old Toronto back street, away from the noise and crowd of Queen Street, in a big old building that looks like an old firehall (but was originally a bakery built in 1902). The creep factor already sets in before the show even starts. Night of the Living Dead Live! starts off much the same as the film does, with Barbra (Gwynne Philips) and her brother Johnny (Andrew Fleming) visiting their father’s grave. Barbara is noticeably uncomfortable in the graveyard; something Johnny takes advantage of by teasing that “They’re coming to get you, Barbra”. Barbra is attacked by a strange zombie-like man (Trevor Martin), who Johnny tries to fend off but he falls and bashes his head killing himself. Barbra flees to a farmhouse where she discovers a woman’s mangled corpse, screams and that’s when Ben (Darryl Hinds) enters to try and calm her down. 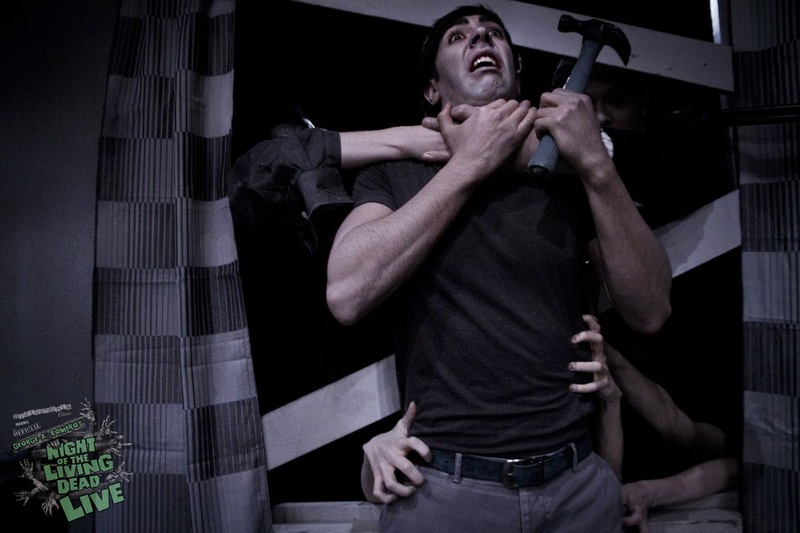 Barbra slowly descends into a shock-driven comatose state as Ben begins boarding up the doors and windows. 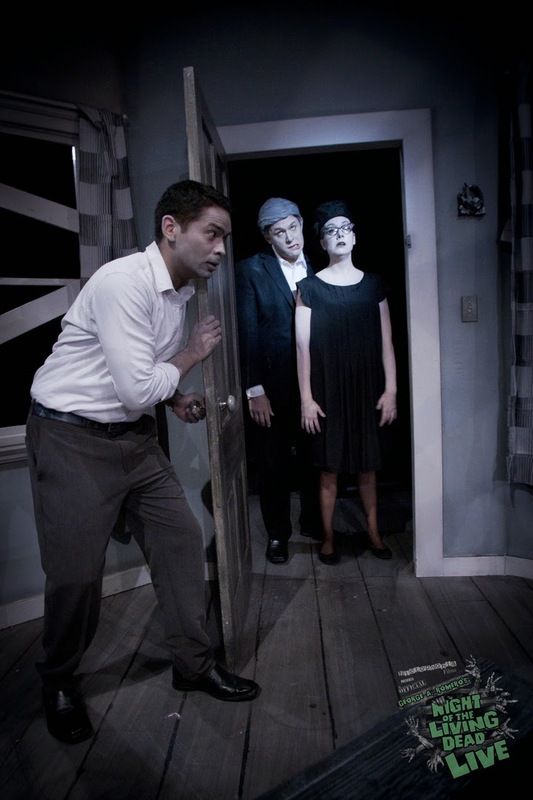 While taking cover in the farmhouse, Ben and Barbra meet Harry (Mike Nahrgang) and Helen (Dale Boyer) Cooper, who have been hiding out in the cellar with their daughter Karen and teenage couple Tom (Andrew Felming) and Judy (Dale Boyer). This is where it all starts to go downhill. This is the point that you notice the character list has started to outnumber the cast list. With a cast of only six, each person is relied upon to play multiple roles, seamlessly pulling off quick costume changes, having to be on one side of the stage one moment and then directly across the stage a half a second later. We’re always so impressed by the talent and organization this kind of acting requires. Props to Dale Boyer particularly, who was called upon as two main characters often having to quickly transform from one to the other in the same scene multiple times. 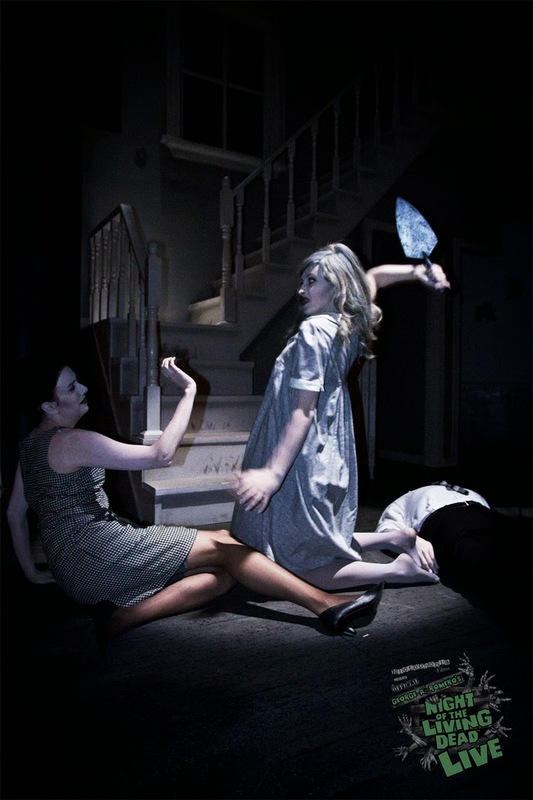 The classic film is iconic in black and white, something the production team decided to try to incorporate into the play. Each character was wearing a layer of white-ish makeup, turning themselves a black-and-white film colour of grey. The stage set was created with subtle blacks and greys and whites causing a similar black-and-while tv feel and the video screen projection used throughout vital scenes was vintage looking, intertwined with actual clips from the film. This whole feel played out extremely well and was very cool to watch. 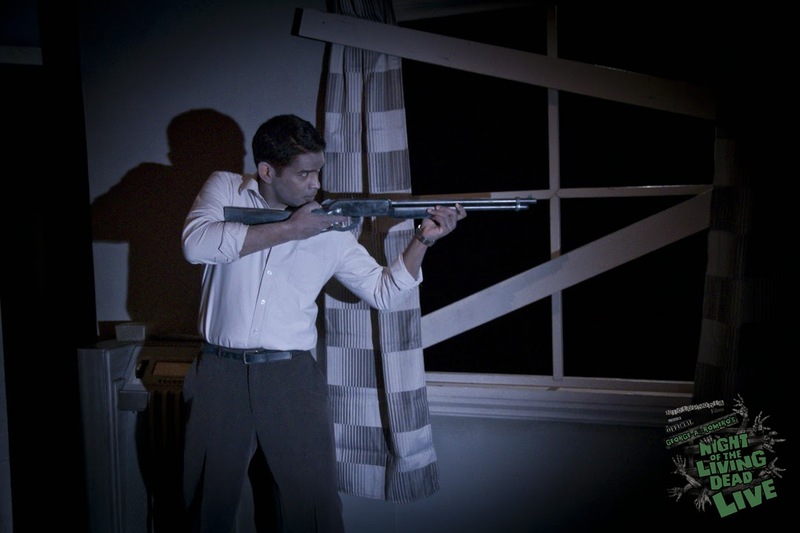 Instead of using the entire run of the play to take us through the movie scene for scene, Night of the Living Dead Live! is done through a series of multiple endings, where the characters are all faced with different issues and challenges as they desperately try to survive the night. The play starts at the beginning, with the local Sheriff coming to inspect the farmhouse scene. He and his deputy run through theories of what could have been done differently to help ensure their survival and each theory is played out – to their endless demise – in front of us on stage, each scenario cleverly incorporating elements from the film for the audience's amusement. The entire production is incredibly well done and the concept is quite cool. We don’t think enough people know that this play exists; we were supremely surprise by how many empty seats there were at last night’s production. If you’re at all into zombie culture or classic horror films or are just looking for an interesting, unique night out, Night of the Living Dead Live! is something you need to see before it’s too late.